The new 20 gauge Mossberg 590 Shockwave features their signature Shockwave Raptor® bird’s head style pistol grip which allows the shooter to gain a firmer grip for less felt recoil. Like all Mossberg pump-action shotguns, it comes equipped with an ambidextrous safety that is easily operable. The 590 Shockwave's other attributes include a clean-out tube magazine cap, a front bead sight, and strapped forend to keep the shooters hand clear of the muzzle while firing. is this illegal in ohio? BEST ANSWER: Ohio general assembly just voted to override kasich veto of HB 228!. This will become legal in 90 days! Update...Ohio passed emergency legislation. It is now legal. Order now. Palmetto is so slow to ship that there is no way they ship it before March 28.
should take effect sometime in March 2019. It’s March now is this gun legal to buy in OH? It became legal in Ohio yesterday or today. Does this come in a stainless steel option? Hi do you shipp to Puerto Rico? BEST ANSWER: bought mine from PSA And had it shipped to Colo.
is this good for hunting turkey? BEST ANSWER: Assuming this is a serious question, probably not. For any type of hunting, you're going to want a full-sized shotgun that you can shoulder, especially for turkeys. 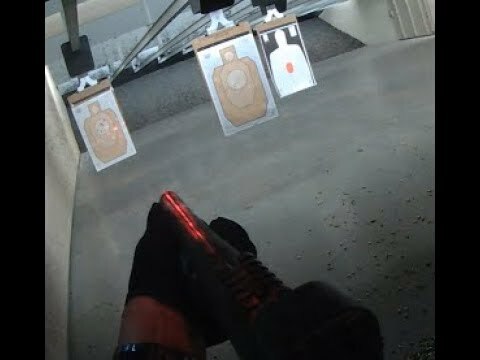 This shotgun really shines for up-close personal defense, such as home defense. Can I get it in Colorado? BEST ANSWER: I think so. IS THIS LEGAL IN PENNSYLVANIA.???? BEST ANSWER: Yes it is! Pennsylvania still supports YOUR 2A rights. does this come in 410? BEST ANSWER: Yes, comes in 12, 20, and 410. Is this too short in California? 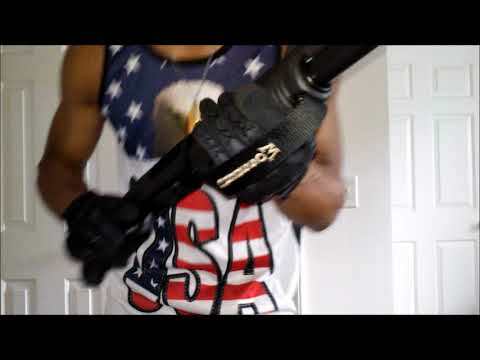 Would it be legal if a fixed buttstock was added instead of the pistol grip? Not a lawyer, but my understanding is that you would not be able to add a rifle buttstock. You could add one of the many pistol stabilizing braces though to the same effect. Any modification will require ATF tax stamp, just enjoy it for what it is! You would first have to complete and submit a Form 1 with the ATF along with the appropriate fee for the tax stamp and wait until you get the stamp back approved before you can put a fixed buttstock on it. In the interim you could buy and install the SB Tactical Pistol Support Brace. NFA Tax Stamp in 200.00USD and 6 month to 1 year wait, You Can NOT make any modification that would make a NFA Item until your Tax Stamp come in, and then only the mods you have listed on the Form 1 Application. As to States that SBS/ SBR are legal in check on the ATF's website and you States website for that answer. It’s designed for home self defense, not to be shoulder fired. The purpose of the setup it comes with is to reduce recoil. reduce FELT recoil. Not actual recoil. Probably not, depends on the State, would probably require a class III license. Only need a tax stamp if you get caught. Land of the free. When You get caught, or when your kids get caught for trying to sell your estate. BEST ANSWER: All you people-check your laws, it's not hard to do!! Does that ship to buyer in Tennessee or to an FFL ? Does this use regular 20 gauge shells? BEST ANSWER: Yes. I'm hoping SB will come out with a folding fore arm brace for it. I have a TAC 14 with one. It really is a great improvement. The 20 gage Mossy, is great! Yes, that's why they call it a "20 Gauge". It is fun to shoot. Yes. Both 2 3/4" and 3" shells will work. Happy Shooting! The i need a FFL for this item? BEST ANSWER: You have to do a transfer through your FFL to purchase the shockwave but you do not have to have an FFL yourself and it does not require a Federal Tax Stamp. Yes you will need an FFL to send this to. It is a fire arm, will be registered as “Other “. You absolutely must have this item shipped to an FFL in order to complete this purchase. Yes, check psa has many ffl's on file to ship to. Can I buy accessories from Palmetto? Is this legal in Illinois? In one of the videos the guy is showing 12ga minishells with an adapter. How will this 20ga shoot 12ga shells? BEST ANSWER: No. 12 and 20 are two different things. Theres no way you can get a 12ga shell in a 20ga barrel they're to big in diameter. If you wanted you can custom make some shorty 20ga shells so it holds more. It won't that I'm aware of. Never heard of a 20g that shoots 12ga shells. 12ga won't even fit in a 20ga. It won’t. The adapter was for the length of shell not gauge . 12 gauge goes in 12 and 20 goes in 20. It won’t. It’s a 20 ga. 12 ga shells won’t fit. The mini shells are only made for 12ga. Is there a gun case that fits the shockwave? BEST ANSWER: There is a scabbard made by voodoo tactical. Yes I found a case at Sportsman Warehouse, it was a junior .22 cal case I believe, they have quite a lot to choose from, do what I did, measure it and then go shopping. Yes. There is a Soft Case in Olive Green that is from Mossberg that fits perfectly. What one is it? Do you have an item number? I live in Floral Park NY. Can I purchase and own it? BEST ANSWER: HAHAHA,,, I GREW UP IN HEMPSTEAD,,, YOU WOULD HAVE TO CHECK WITH YOUR LOCAL NEW YORK COMMUNIST LAWS BUT IF I WERE YOU I WOULD MOVE OUT OF THAT WELFARE STATE,,, I DID 7 YEARS AGO ! Maybe. Try and buy it. If it's ok for to have, PSA will send it to your FFL. If not, nope. Good luck. Is this an nfa item? BEST ANSWER: ANYONE CAN BUY ONE, LISTED AS OTHER ON THE 4410,,, NO SPECIAL PERMIT REQUIRED ! No it is not. Does not qualify as NFA or AOW, can be bought like any other pistol. It classifies as an "Other"
can this be mag loaded? BEST ANSWER: Not as-is. 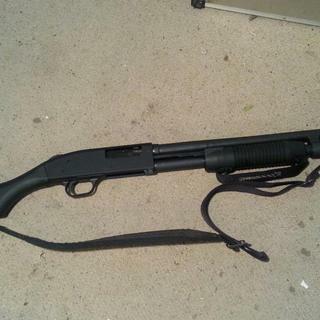 It is a standard tube-fed pump action. No it can not, standard tube load under barrel. If you mean high brass loads than YES. is this a new or used gun? BEST ANSWER: NO! It is new and packaged perfectly. Is this weapon legal in Ct? BEST ANSWER: Ask your Sheriff. It's not illegal to ask, yet. Is this legal in Oregon ? Can I have this shipped directly to my home or do I need to have it shipped to my local range? Is this of legal length for a New York resident to own? will it ship to my home? Is this available in the Greenville store? Can you ship this to your home or does it have to be a gun shop ? Great American made firearm! Rugged, reliable and a fantastic value. 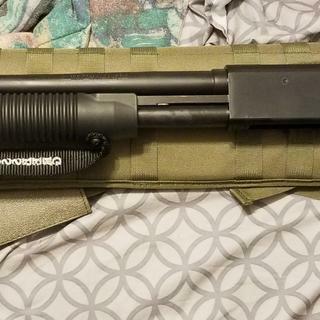 Truly pleased with the performance from my Mossberg, and as always, happy with the service from Palmetto State Armory. Grab a 100 round value pack and a couple 5 round boxes of 00 and slugs. After an afternoon of point shooting you'll be surprised with your ability to hit. Kicking cans around a field with a 20gauge is good fun! I haven’t had the chance to fire it- The safety cannot be disengaged! From my hands back to Mossberg. Excellent purchase very good deal.. Very fun to shoot excellent control with low recoil. Awesome firearm! Ran some slugs and buckshot through it. Hits hard! Can't explain for it. That's awsome and love to shop with Palmettostatearmory.com. PSA was ontime with delivery and the price couldn't be beat. No regrets about getting the 20 gauge. 12 gauge stuff I shoot from a long gun. For the up close ranges where a Shockwave is suited, a 20 gauge is plenty powerful, IMO of course. Hit everything I pointed it at shooting from the hip. Wasn't too much to hold onto. Love it! Great, I love it, it works great , and shoots great. Thank you PSA for the awesome service! I will definitely go shopping at PSA again! I love my 20 Ga. Shockwave! Fun little firearm. Easy to hold onto very happy with the product. And as always great price and free shipping from PSA best in the business!! Shipping was fast. Great experience! It sounds like you may have an issue with your firearm. 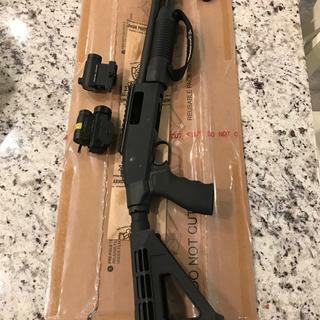 Please contact Mossberg here, https://www.mossberg.com/contact-us/, to discuss the issue with your safety. Well built, very handy size and fast handling. The Shockwave is a great little personal defense weapon. Since I purchased my 20ga version, three other friends have purchased one also. It's a great little gun to take camping or in my case, I throw it in the back of my Goldwing when traveling cross country. And, it is just fun to shoot. I put a small flashlight/laser combo, which works perfectly for this gun since it is somewhat difficult to aim unless you are proficient from shooting fro the hip. I would recommend the Shockwave 20ga to anyone who is looking for a home/personal defense weapon. This will take care of bears,2 legged creatures, and scare all but the boldest of intruders. Just the answer to close range needs without high volume mag capacity. It's well made and fast. The best part is quick barrel settling time for fast follow up shots and low recoil overall. PSA has a great deal on these. It is a great home defense gun. Fun to shoot too. Hard to beat the price also. Worth Every penny for home defence . Works very well. Thought I’d have problems since I’m “elderly” but turned out to be very good short range weapon. Slugs in mine. Has provisions for sling. Take it on hikes in the back country. Awesome "other" firearm. Good price and fast shipping. Love this gun. Fun to shoot. After watching many videos on the shockwave 12 gauge, I wanted something with a little less kick and decided to go with the shockwave 20 gauge. I absolutely love it. The only draw backs are that mini shells are not yet available in 20 gauge and the quad rail that I purchased fits great and looks great but shell holder is made for 12 gauge but I installed velcro in shell compartments and it works perfectly.. over all a great gun and fun to shoot. It, in essence becomes an SBS with the brace and significantly easier to shoot and hit with. Highly recommend that addition. It would also benefit from screw in chokes and the heavy 590 barrel has plenty of metal to add them. Handy as a pocket on a shirt. With number 3 buck loads it kills at both ends, though. Good I have purchased several items from PSA and have always been happy . 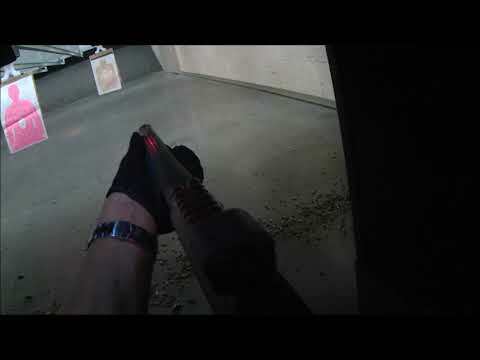 I have two of the 590 shockwaves , the first one I am pleased with, the safety is very hard to move. The 2nd one I just got from you will not let me put in more than two shells, Please advise as to what the issue is and what can be done to correct . I was surprised how much fun it is to shoot, but it is loud. Oh its awesome! Best price on a 20ga. With transfer still came in under $300. Works flawlessly! Great gun. Get them while they're legal. 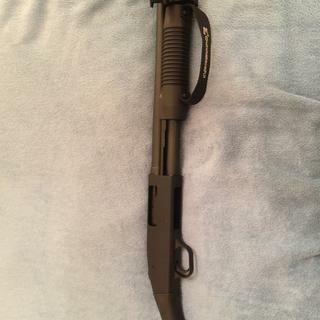 I bought this as a bedside firearm and it seems well suited for the purpose. It does take a little getting used to as I think the tendency is to shoot high. For small space personal protection, I don't think this is an issue at all. There is also a limited choice for self defense rounds for the 20 ga. Other than birdshot and slugs, the only shells I found are #3 buck (24 pellets @ .25") and, again, this is perfect for close range protection. Serves the purpose very well. Much less kick than a 12 gauge. Really like the forearm strap. Loved it so much, I bought a second one. Perfect Security and self defense gun. It shots great, light recoil and quick to deploy with minimal effort. Love it. Feels nice. Looks nice. Can’t wait to shoot it. I love this gun. Easy to control and aim. Good for HD. Great and fun weapon to shoot!!! 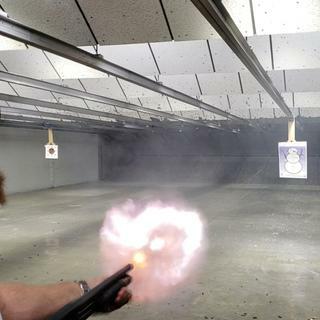 Make sure to wear hearing protection while shooting at the range. Learned that on the first round. Also great service and fast delivery!! Awesome a joy to shoot! I own both the 12 and 20 gauge. The 20 gauge is very soft shooting. Already put a brace on mine. Now it's a all day shooter. PSA had the right price I am glad I waited to buy it. have been very pleased it. I checked several local gun shops and every one told me they couldn’t get close to the price. A very good selection for a defensive tool. The recoil is controllable and it's pretty hard to miss at 30 feet. 20ga. #4's will permanently stop aggressive attackers. Great shooter fun and easy to use. There are a ton of accessory's out there for it. You can't go wrong on this. Easy to handle. Perfect for home defense. Expected more recoil, but very manageable. Finally, I have been waiting for this deal to come along! I have been waiting for this deal to come along. 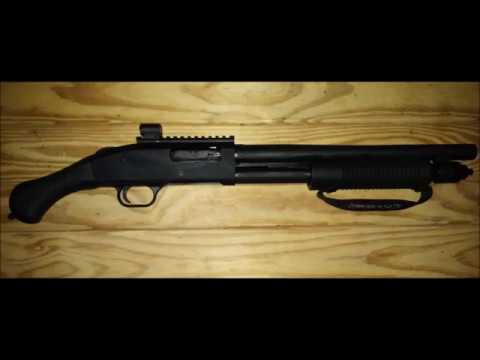 The 20ga Mossberg Shockwave is one of the best home defense and RV/Truck guns you can buy. At the clearance sale price you should buy two. Add the SB Tactical Pistol Support Brace, a Monstrom rail, a green light laser or red dot optic and/or laser it truly is a point shoot firearm. Use low reoil #4 or #7 shells for inside the home and it is a very sweet shooter. Perfect for an older Mom and Dad, a single mom or a guy like me. Thanks PSA for getting us a great deal. When I saw the price on this I could not resist to order it. Just picked it up from my LGS yesterday. Thrilled to pick it up and cannot wait to take it out for some fun. Also picked up a scabbard for it and fits great and will make a nice addition to my collection. This is my second short barreled shot gun. I like this one as much as the 12 gauge Remington I bought last time you had a blowout deal. My attorney son is still playing with it . As I stated before everyone loves it and when I put a sling on it and throw it over my shoulder Mr. rabbit has hid away.. If this is legal in your state go out and get one before the newly elected Democrats raise a stink about these. My FFL can not sell these at that price.I have never been disappointed by these guys specials.